Georgetown, Guyana- (September 17, 2018) President David Granger, on Saturday, ordered that a multi-agency task force be set up to address the many multidimensional issues challenging the communities of the South Rupununi. The President was at the time visiting the community of Shulinab, Upper Takutu-Upper Essequibo (Region Nine) for Heritage Day celebrations. The Head of State’s decision followed a number of complaints by Toshaos of the various communities about illegal mining, pollution, allegations of trafficking in persons (TIP) among other criminal activities, affecting their communities. He committed to having the many issues presented to him by the South Rupununi District Council (SRDC) investigated and remedied. “[There is need for] setting up of a mechanism for the regular if not continuous, exchange of information and more important, the solution of these problems. It is no point, at this stage, resorting to the ministerial system – I am thinking along the line of a multi-agency task force which can deal with all of these problems as they occur. We must deal with the problem in a more holistic way,” President Granger said. 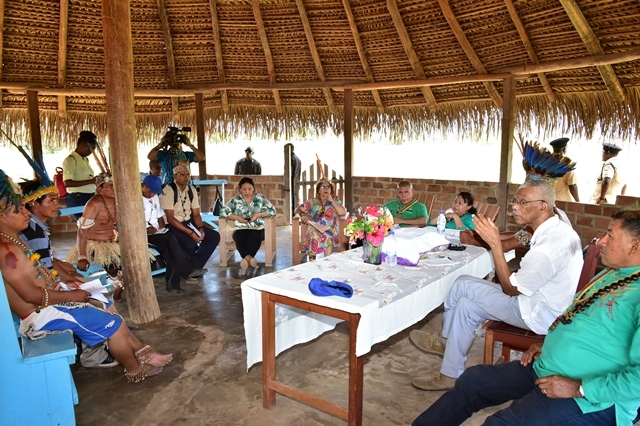 President David Granger (second right) addresses Toshaos of the South Rupununi after hearing their concerns on a number of issues. Also in photo are Ministers of Indigenous Peoples’ Affairs Mr. Sydney Allicock and Mrs. Valerie Garrido-Lowe, Minister of Public Affairs Mrs. Dawn Hastings-Williams, Minister of Social Cohesion Dr. George Norton and Guyana’s Consul General in Roraima and other Northern States of Brazil, Ms. Shirley Melville. Saturday’s meeting follows one held in Aishalton, Region Nine, in February where similar concerns were raised. The Head-of-State, after listening to the presentations, said that the situation warrants immediate attention and called on Minister of Public Affairs, Mrs. Dawn Hastings-Williams to organise stakeholder meetings in the near future. 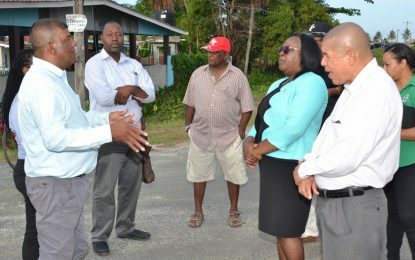 In the case of environmental issues, the President said that the Environmental Protection Agency (EPA), Guyana Geology and Mines Commission (GGMC), and the Protected Areas Commission (PAC) must work together “to bring an end to this scourge and contamination of the headwaters of this village”. In thanking the SRDC, which monitors the South Rupununi, for a comprehensive report President Granger said he is very concerned about the contamination of the headwaters as well as the increase in criminal activities in that part of the region. “So from every point of view there is cause for concern. It calls for all-round vigilance, it’s not just the environment, it is also security, public health,” the President said. The Head of State then called on leaders to commit to preserving the environment and to co-operate to solve problems in the region. “Problems have to be solved…we are committed to solving the problems and not to sweep the problems under the carpet,” he said, while calling on Minister Hastings to convene a roundtable with all stakeholders to address the matters. Meanwhile, Minister of Indigenous Peoples’ Affairs, Mr. Sydney Allicock described the challenges “as very serious” while stating that they must be addressed soonest. “It is bigger than just a Toshao,” he said, noting that there is need for a lot of technical and financial support to remedy the existing difficulties. Similarly, Minister of Public Affairs, Mrs. Dawn Hastings-Williams said a proactive approach is needed to tackle the many issues raised and committed to working with stakeholders. Additionally, Mr. Nicholas Fredericks, Toshao of Shulinab, said despite the many challenges facing the South Rupununi, the SRDC is pooling its available resources to be “the eyes and ears on the ground”. He too called for deeper collaboration among stakeholders while noting that information sharing, in a timely manner, is critical to finding solutions to the problems. 2018, DPI, Environmental Protection Agency (EPA), Guyana Geology and Mines Commission (GGMC), Heritage Day Celebrations, President David Granger, Protected Areas Commission (PAC), Shulinab, South Rupununi, South Rupununi District Council (SRDC), Upper Takutu- Upper Essequibo (Region Nine).